Welcome to Chapel by the Sea's library catalog. 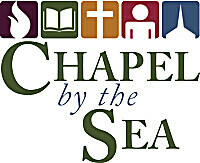 The Chapel by the Sea library is located upstairs in the Christian Education Building and is for the use of Chapel members and regular attenders. In order to respect privacy, books are checked out on an honor system. Simply remove the index cards from the books you wish to read and leave them in the "check out" box in the library; there is no need to write your name on the card. Please return books within three weeks so that others may enjoy them. There are no set hours; please be respectful of other groups who may be meeting in the library.